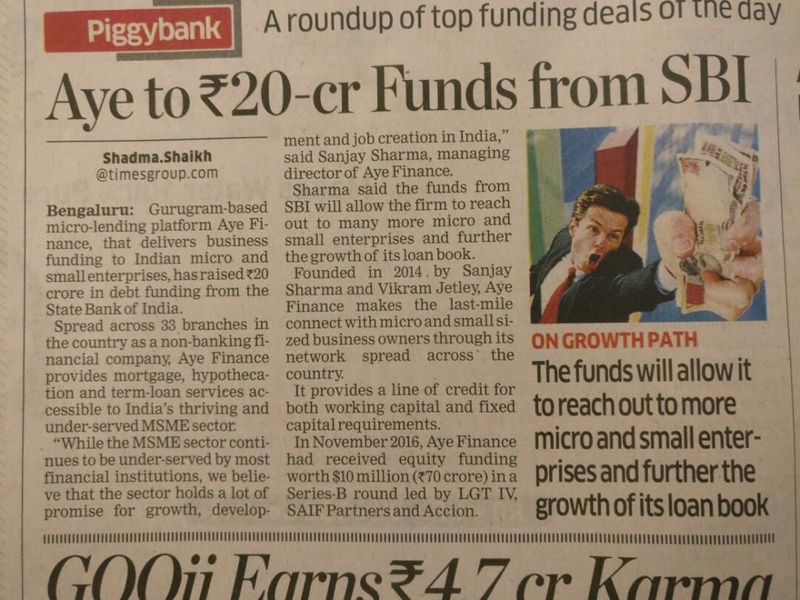 March 2019: MSME lender Aye Finance has raised ₹233.62 crore in Series D equity round, led by New York-based investment firm Falcon Edge Capital. 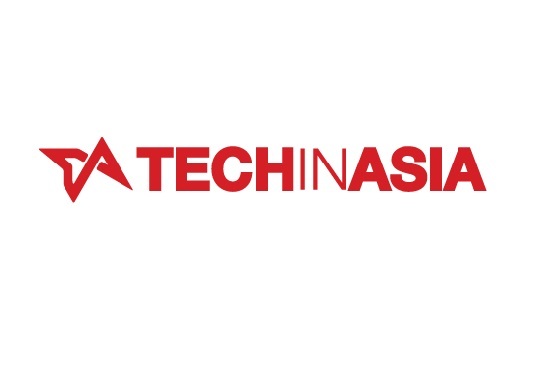 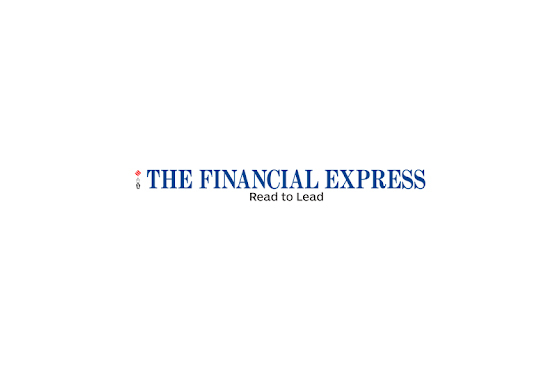 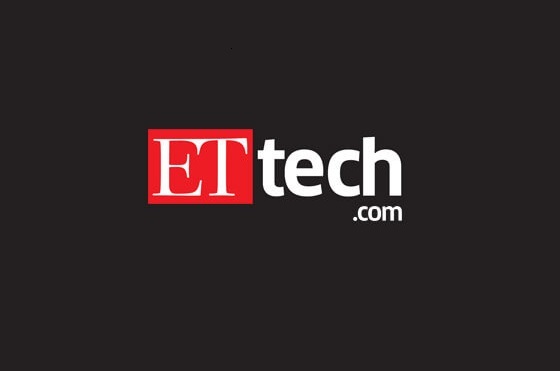 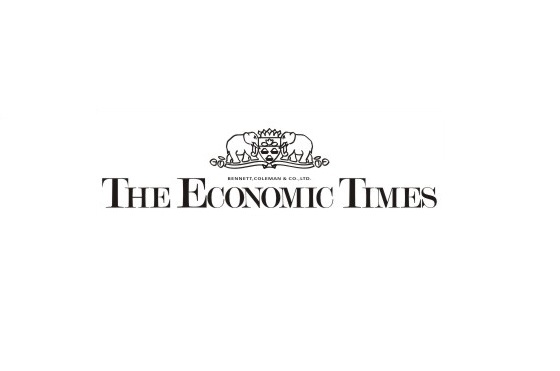 Read more about our future plans, our growth that’s exceeded 350%, and more in our coverage by The Financial Express (India). 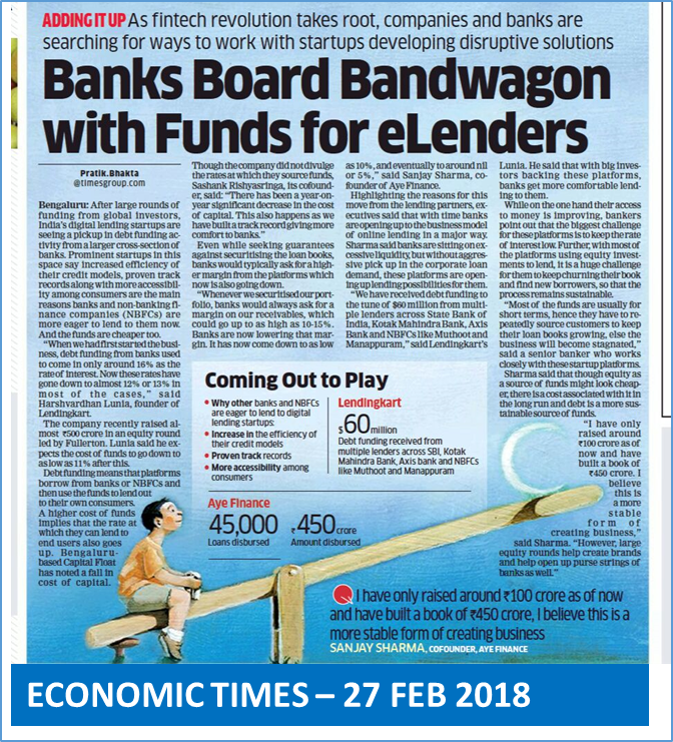 August 2018: Aye Finance MD, Sanjay Sharma, shares his “Eureka Moment” which led to the conceptualization of the company’s unique methodology. 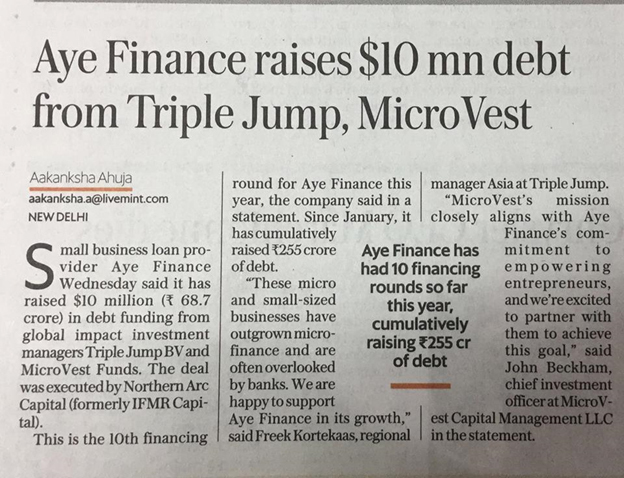 July 2018: Aye Finance has raised $10 million (INR 68.7 Crore) in debt funding from global impact investment managers, Triple Jump BV and MicroVest Capital Management, LLC! 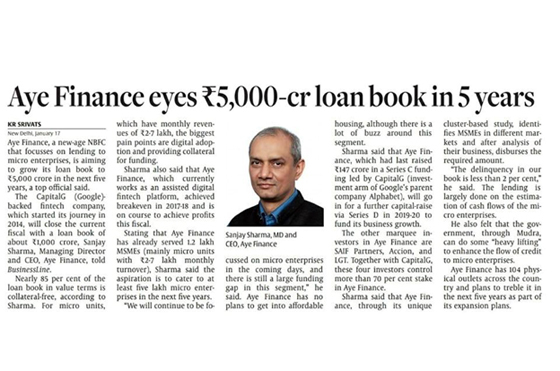 This is the 10th round of funding for Aye Finance this year, bringing our cumulative debt funding to INR 255 Crore since January this year. 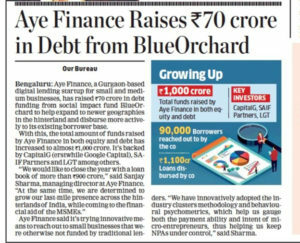 June, 2018: Aye Finance raises $22 million in its Series C round of funding, led by CapitalG, the venture capital fund owned by Alphabet Inc.
May 29th, 2018: Aye Finance has disbursed 60,000 loans since its inception in 2014, to micro and small enterprises giving out a total of Rs 700 crore. 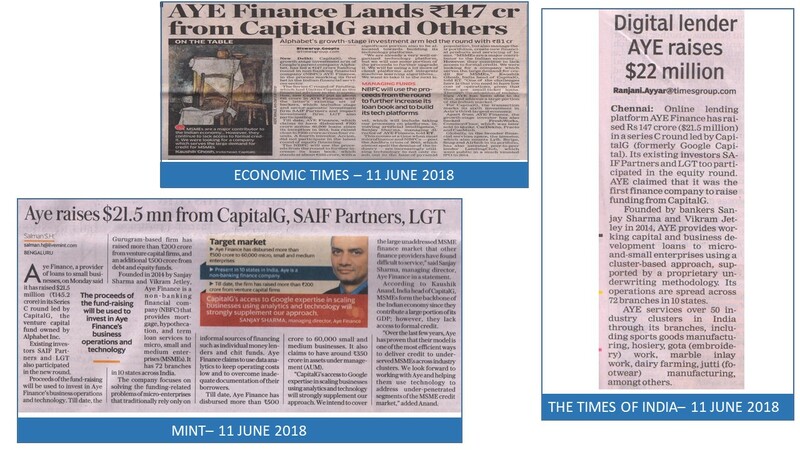 May, 2018: Aye Finance has raised Rs 30 crore in a fresh round of debt funding from SBI. 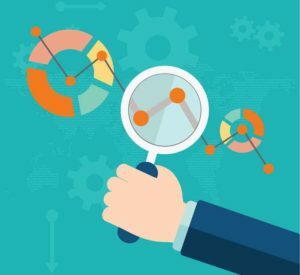 May 2nd, 2018: Aye Finance’s credit assessment method is based on data points from industry-specific clusters. 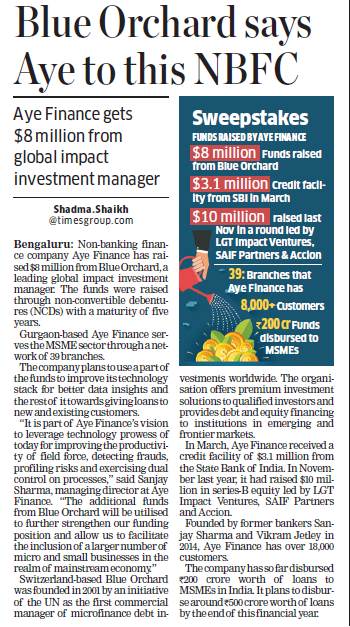 April, 2018: Aye Finance is the latest to raise a fresh round of Rs 30 crore from Swiss-based impact investor BlueOrchard Finance. 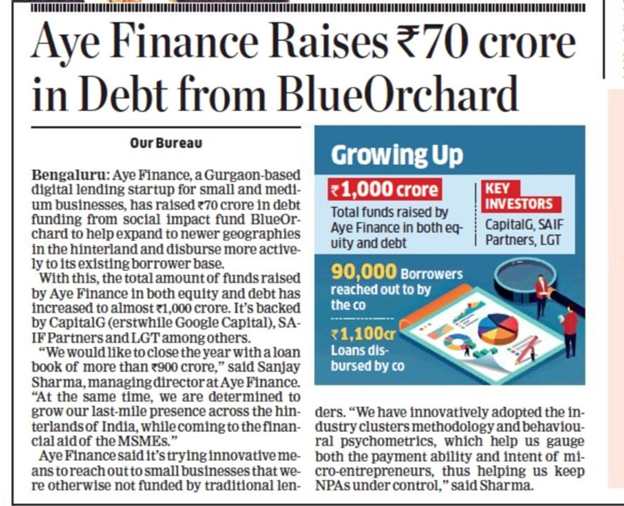 BlueOrchard has already invested more than Rs 100 crore in Aye Finance since 2017. 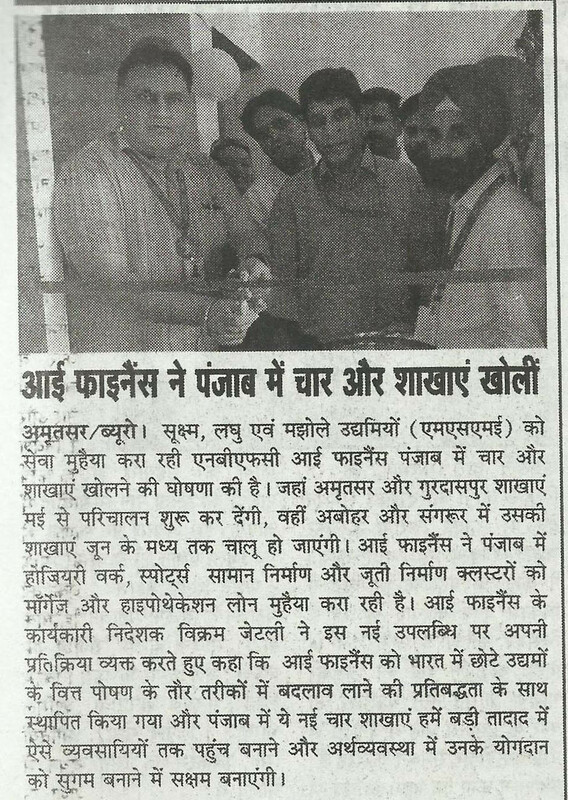 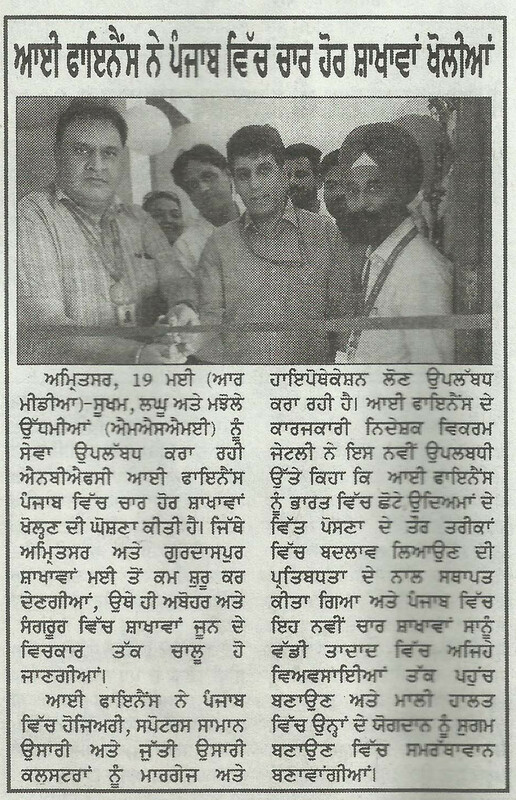 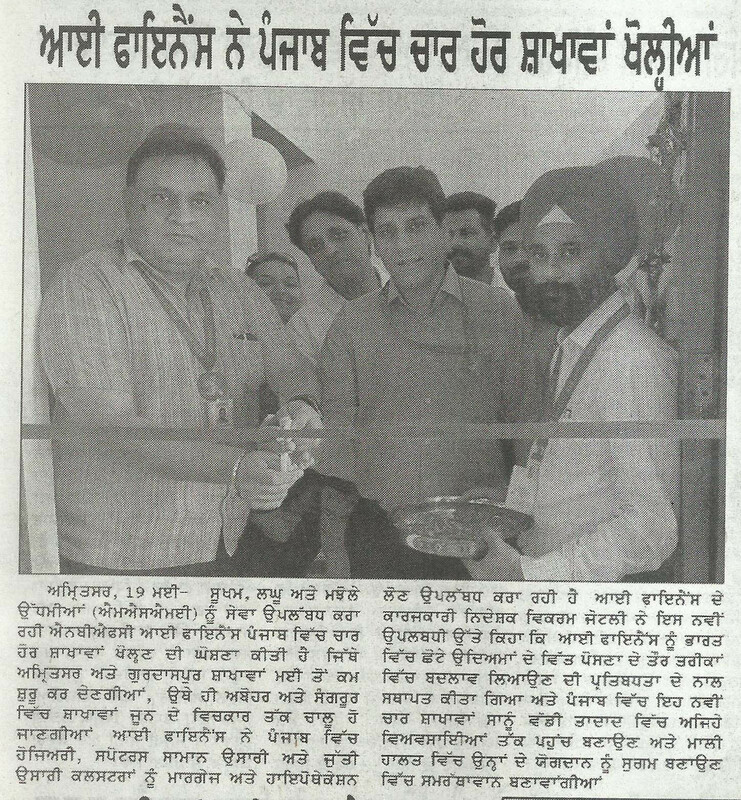 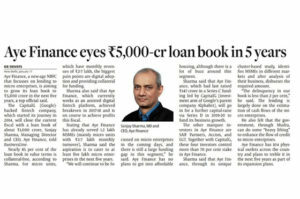 February 27th, 2018: A more sustainable form of business created by Aye Finance, having built a book of Rs 450 crore. 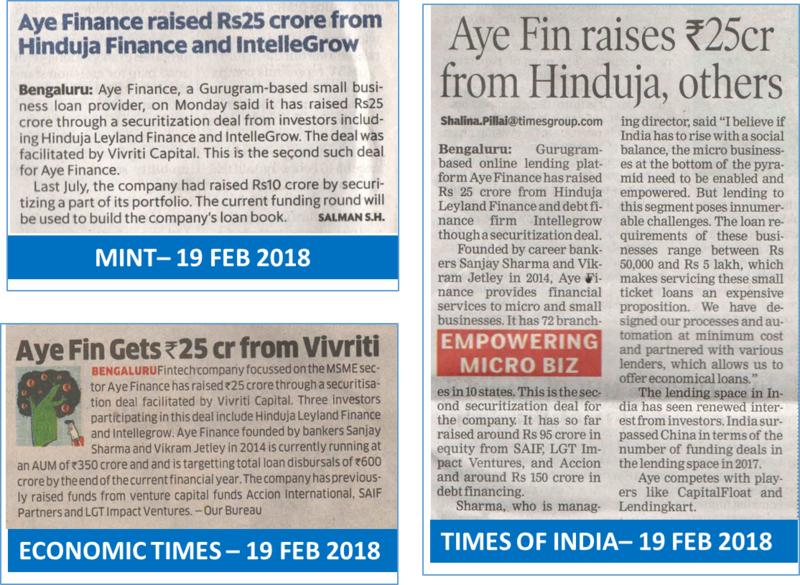 February 19th, 2018: Aye Finance raised Rs 25 crore through a securitization deal from investors including Hinduja Leyland Finance and IntelleGrow. 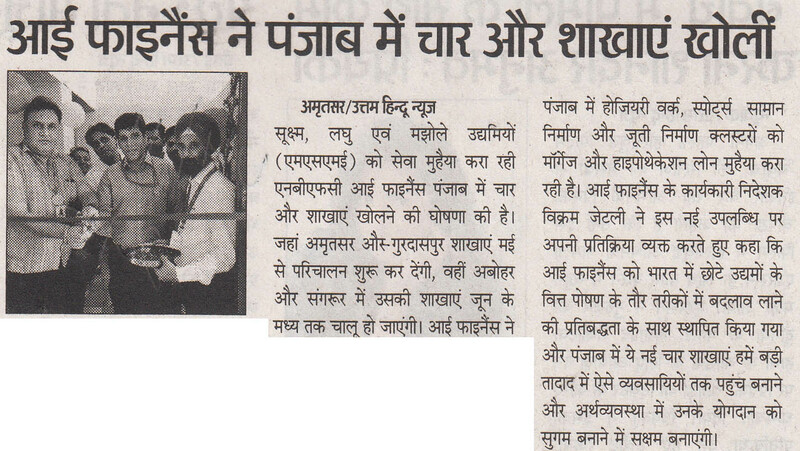 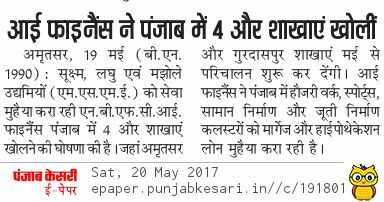 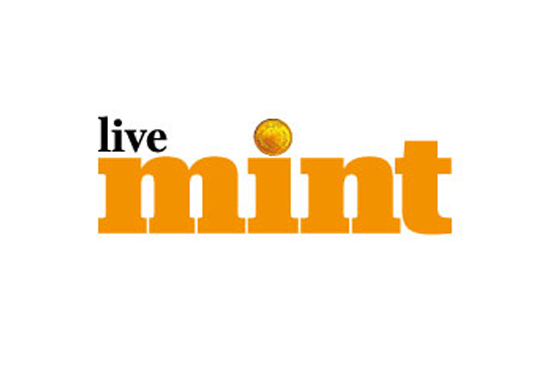 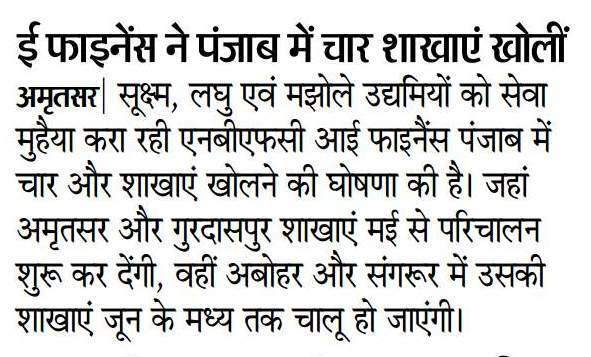 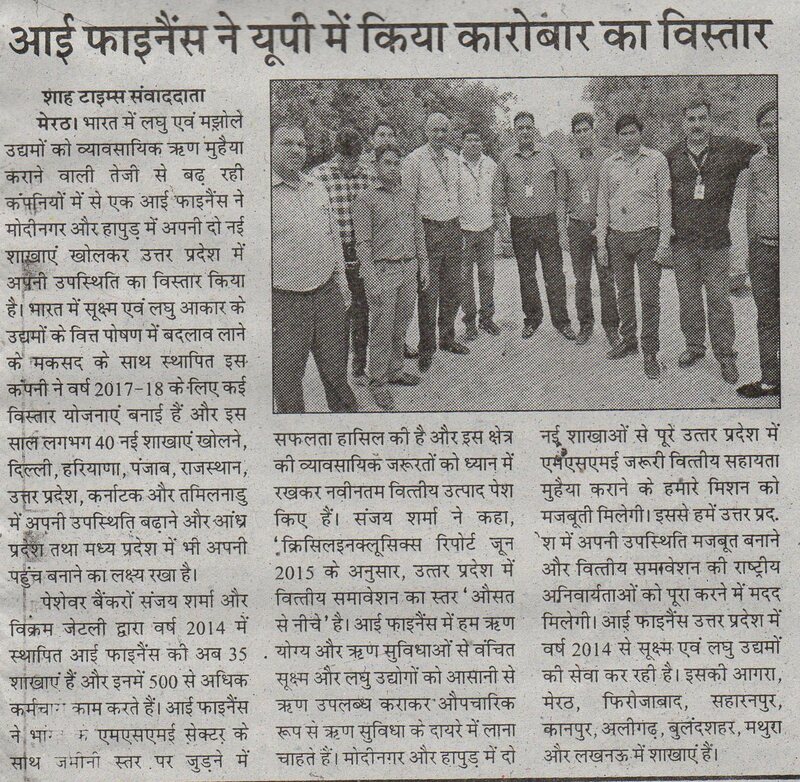 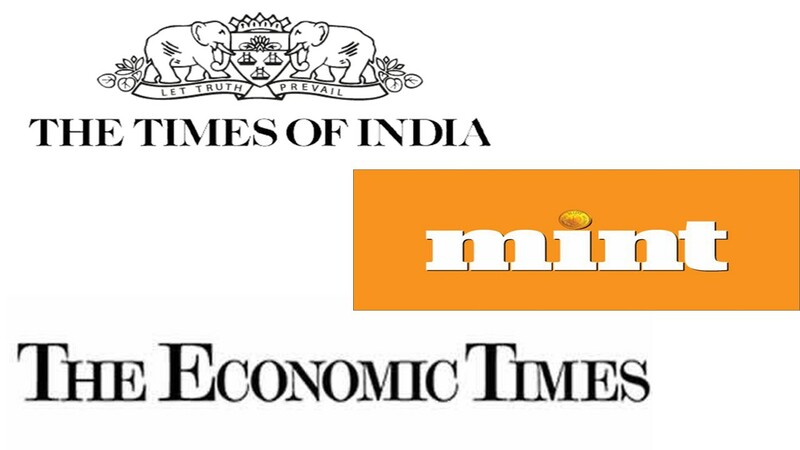 The deal was facilitated by Vivriti Capital. 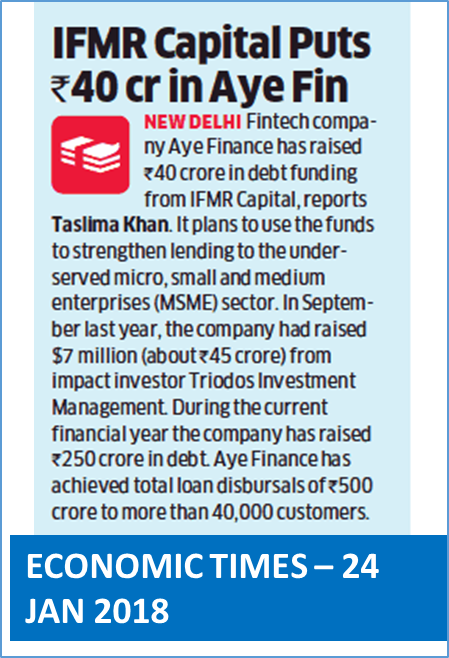 January 24th, 2018: Aye Finance has raised Rs 40 crore in debt funding from IFMR Capital. 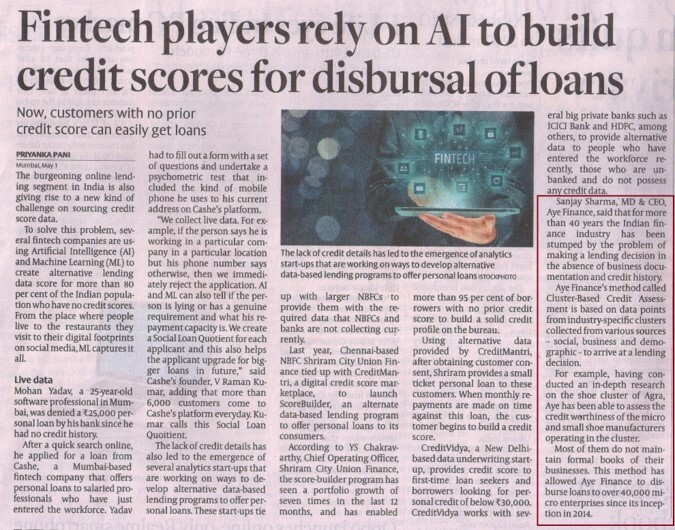 November 7th, 2017: Geneva-based development finance institution Symbiotics Group has led a Rs 32 crore debt funding round in micro and small sector lender Aye Finance. 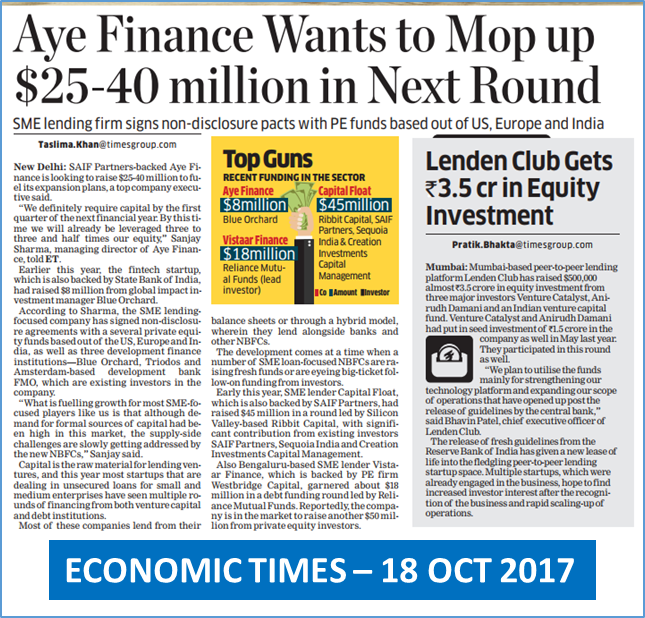 October 18th, 2017: Aye Finance wants to mop up $25-40 million in next round to fuel its expansion plans. 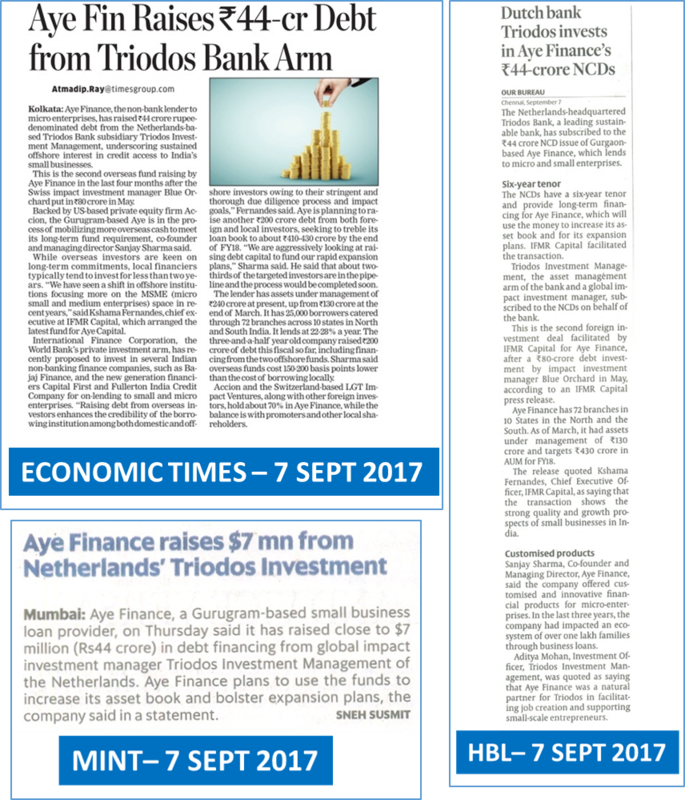 September 7th, 2017: Netherlands based Triodos Bank has subscribed to INR 44 crore NCD issue of Aye Finance. 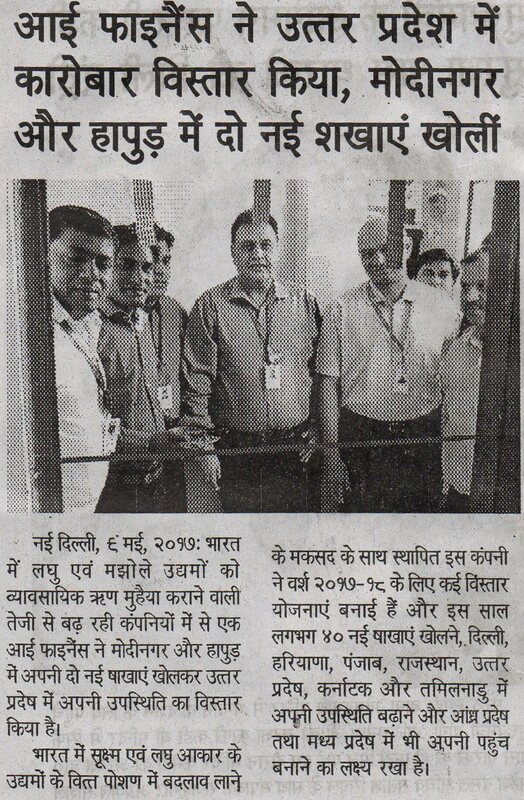 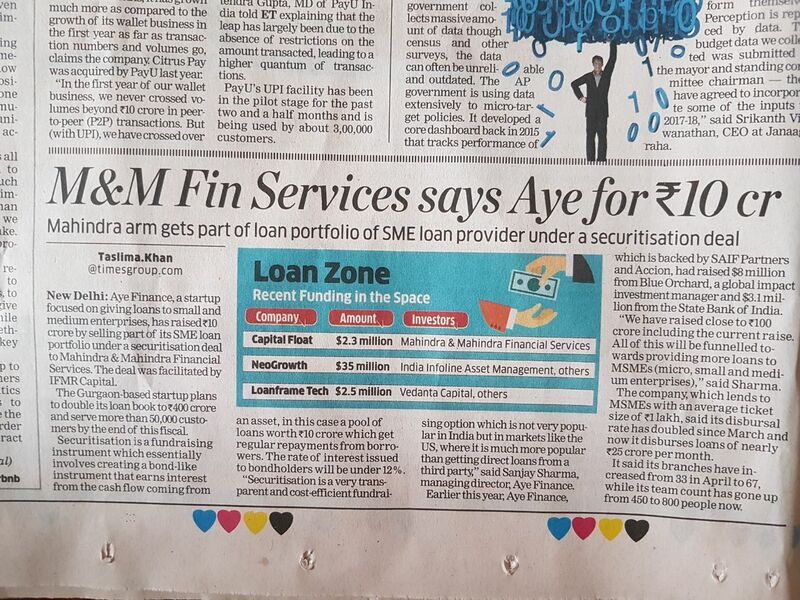 M&M Fin Services Says Aye For Rs.10 Cr. 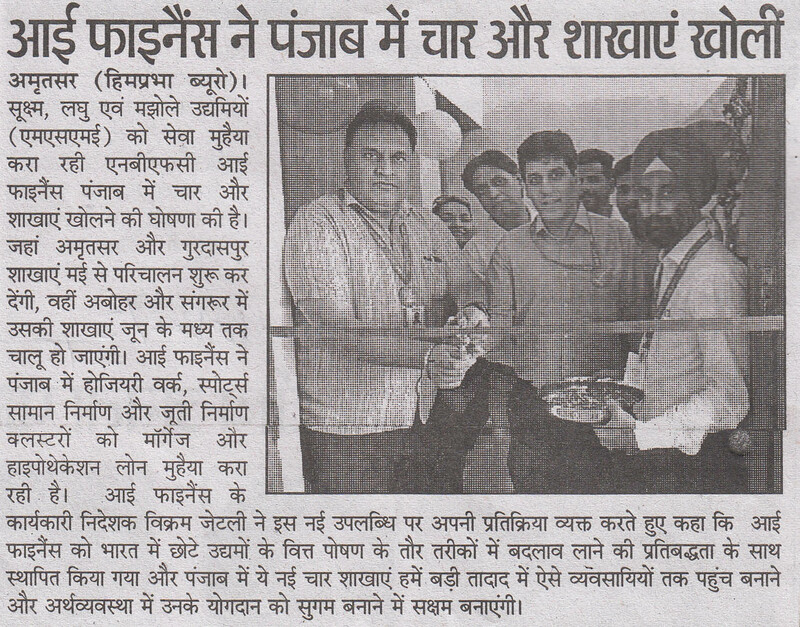 Check it out inside! 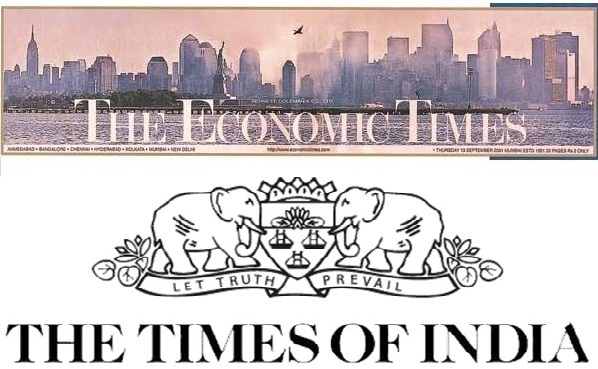 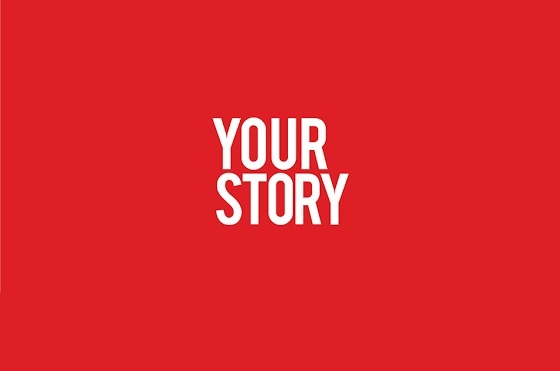 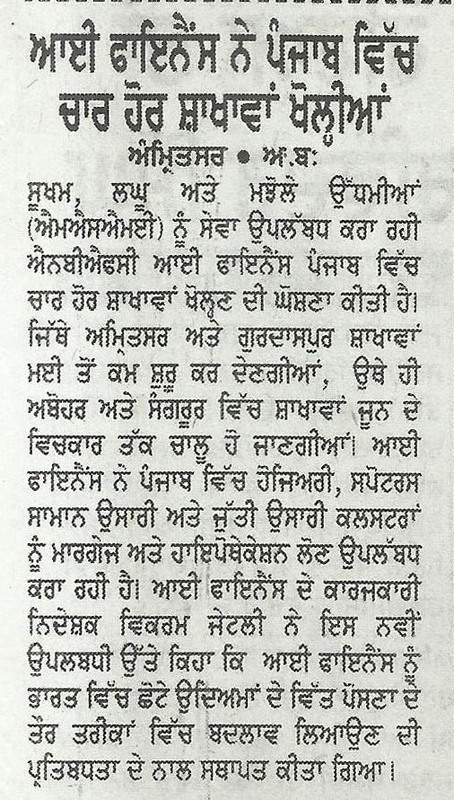 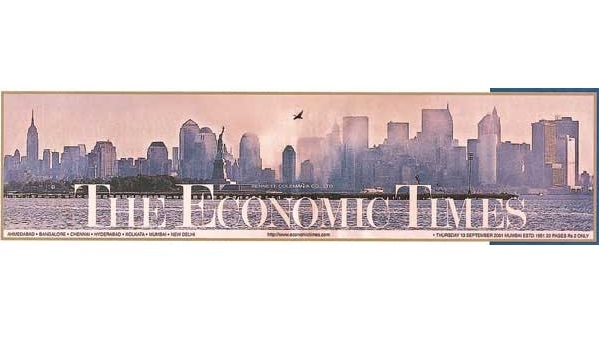 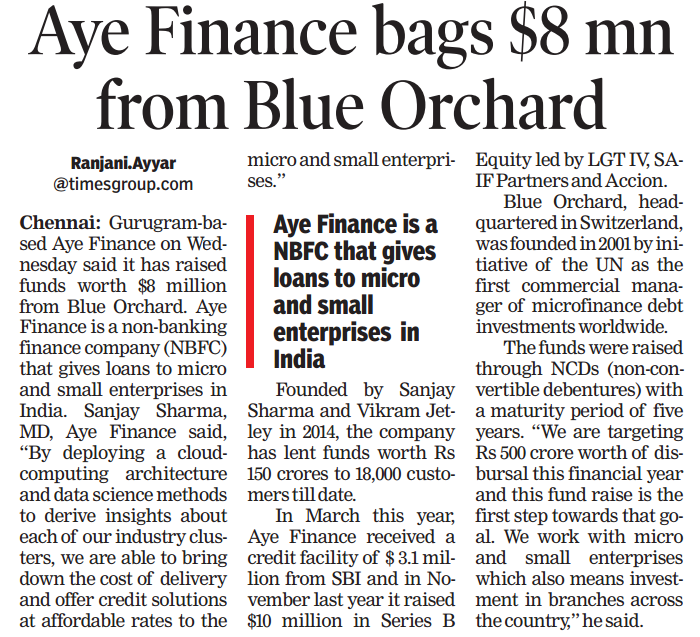 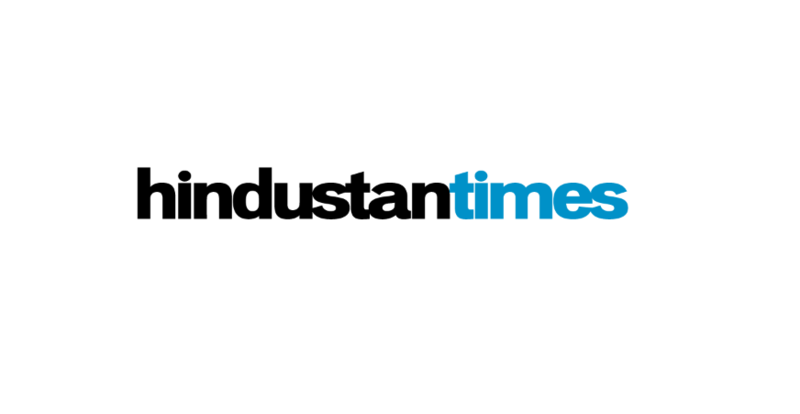 Aye Finance was recently featured in The Economic Times and Times of India, in relation to the new funds raised via Blue Orchard, a leading global impact investment manager. 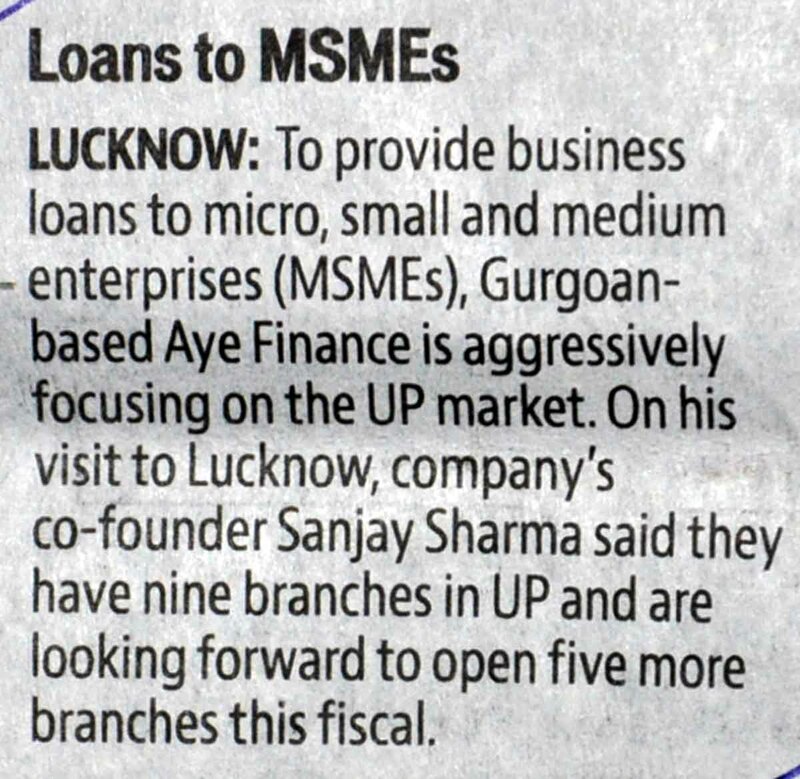 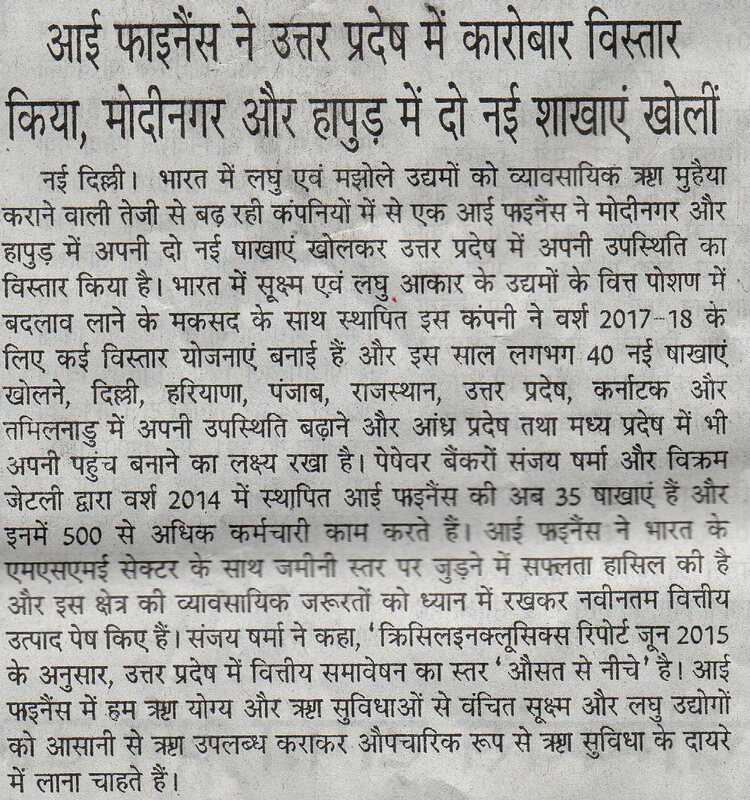 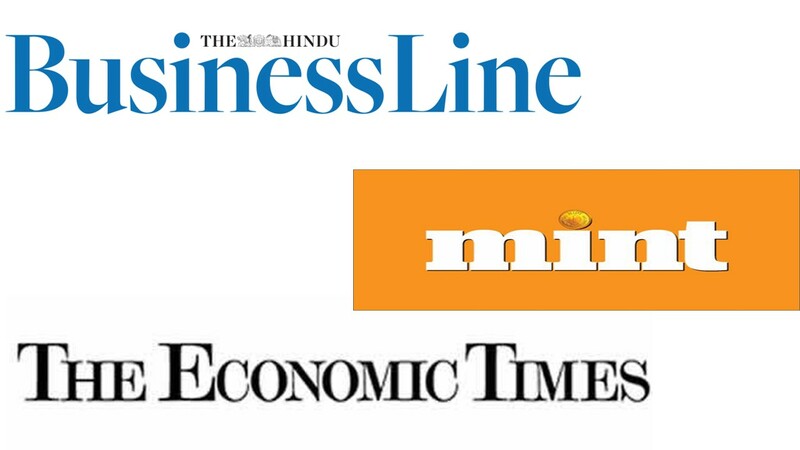 Featured in The Economic Times, the article details the recent funding and achievements of Aye..
LUCKNOW: To provide business loans to micro, small and medium enterprises (MSMEs), Gurgaon-based Aye Finance is aggressively focusing on the UP market. 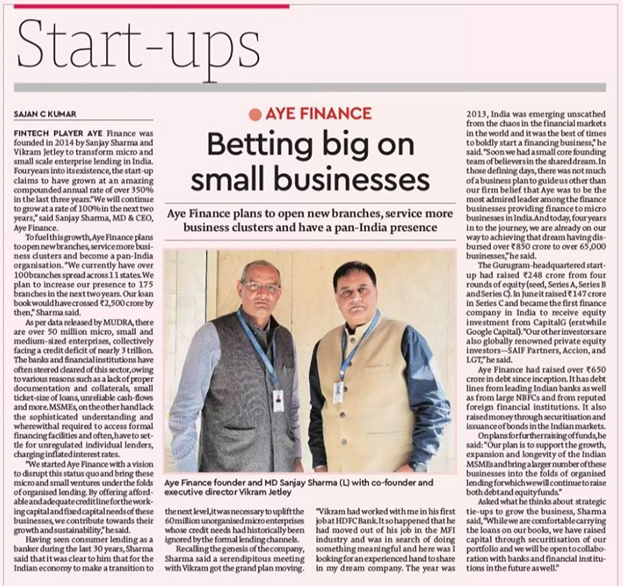 SAIF Partners and Accion announced co-investments in Aye Finance, an India-based lender that will serve thousands of profitable micro, small, and medium enterprises (MSMEs), which are often locked out of both traditional microfinance and commercial capital.